VCT (Vinyl Composition Tile) is the type of flooring found in most office buildings, schools, clinics etc. Below are some important VCT floor care tips to consider. Properly maintained VCT flooring will consistently reflect with a brilliant shine and give a clean fresh look to the space. Your business will benefit from the fresh appearance. We recommend regularly scheduled floor care visits. To find out more about our VCT floor care programs, contact us. Small dirt particles & dust eventually get ground into waxed floors, and over time floors will begin to yellow from the light. In order to restore your floors to a “like new” shine, they will need to be stripped and waxed. We recommended this be done every 12 months, at a minimum, if traffic is medium to low. For high traffic VCT it is recommended to strip & wax every 4 to 6 months. When VCT flooring loses its original high gloss looks and appears dull it is time to re-coat. A scrubbing of the tiles will provide optimum appearance and reduce the need for stripping and waxing, saving you time and money! Floor buffing helps maintain the high gloss luster you desire on your floors. 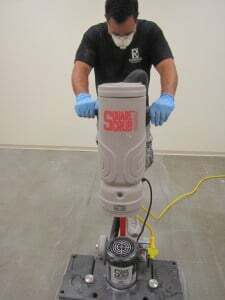 This process uses an ultra-high-speed floor machine to renew the floors surface. We recommend this service monthly for medium to low traffic areas, and weekly on high traffic flooring. Always mop with a neutral cleaner. Other cleaners will slowly strip away the wax. Always use clean mops and change mop water often. Mopping with dirty mop water does not get the VCT clean and will add to the wear on the wax. Always use chair mats! Wheels on a desk chair will not only wear off the wax, but it will eventually scratch into the tile itself. With this kind of damage it will never be able to regain any type of shine. Newly laid VCT always needs to be cleaned and wax applied. Just because it is brand new does not mean it is protected! 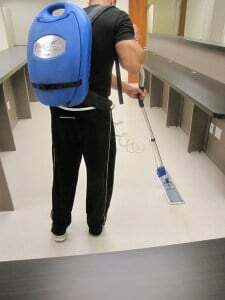 It is very hard to keep floors free from scratches when the VCT is in rooms such as cafeterias, classrooms, bars etc. Any space with chairs that people will be pushing back and forth while sitting will scratch into your wax. These conditions will require scrub & wax and buffing more often to maintain a high gloss appearance.